Be the first to share your favorite memory, photo or story of Rufus. This memorial page is dedicated for family, friends and future generations to celebrate the life of their loved one. Rufus Miles Dixon, age 83, of Carrollton, Georgia died January 26, 2019, at home surrounded by his family. Rufus was born on March 24, 1935 in Dothan, Alabama. He was one of 14 children born to Sandy Thomas and Abbie Lee Nora (Mitchell) Dixon. He joined the United States Navy after attending high school in Cottonwood, Alabama. Leaving the Navy, he opted to serve in the National Guard. During this time, he suffered a serious injury and was in a coma for 26 days. Regaining his strength from the injury, he realized how short time can be and asked his high school sweetheart to marry him. Following his marriage on June 27, 1953 to his beautiful bride, JoAnn McCall, the couple moved to Atlanta, Georgia in 1956 where Rufus pursued an education in fabrication and mechanical engineering. After graduating, he accepted a position with Twitchell Corporation in Dothan. Eventually, career advancement had him move his young family to Scotch Plains, New Jersey in 1964 to become Vice-President of Champion Paper Products. In 1977, Twisted Paper Products, an affiliate of the Italian company of Brandigi and Fantechi, asked Rufus to spearhead the construction on a new business in Greensboro, North Carolina as CEO and a director of the corporation. After the successful startup of the business, Rufus and JoAnn moved to Carrollton, Georgia in 1978 where he founded Dixie Converting Corporation. Dixie Converting is a paper converting company providing a variety of paper products to the Wire & Cable industry, packaging, printing, coating and other specialty areas. Under his leadership and vision, the company has grown and thrived over the past forty years. Early on in his life, he was actively involved in coaching baseball and refereed football/basketball in his spare time. During the 60s & 70s, he refereed at the level of Semi-professional football. While in the Navy, he took up the sport of boxing which ultimately led to a distinguishing feature, a broken nose. When time allowed he also enjoyed fishing, a round of golf, camping, travel and the Crimson Tide. However, his greatest passion was his faith, which was the foundation of his life. Rufus was ardently involved in First Baptist Church of Carrollton, Georgia. 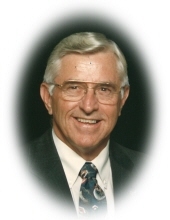 He taught Sunday school and served as the head of deacons for numerous years. He was actively involved in the community earning recognition and awards for his contributions as a community leader. Rufus is survived by his loving wife of 65 years, JoAnn Dixon; sons, Tim (Amanda Beth) Dixon and Chris (Von) Dixon; brothers Robert Earl (Doris), James Delma (Barbara), Freddie Roy (Wilma); sisters Lillian (Messer), Nora Jemima (Bond); grandchildren Joshua (Tamberli), Jessica, Leah, Brittany, Kristin (Jonathan), Adam (Ashleigh), Miles (Lauren), Amariah, Chandler; 11 great-grandchildren, and many other family members. Rufus is preceded in death by his parents; brothers William Lester, Joseph Frank, Jim Roberson, Comer and ‘little buddy’; sisters Madeline Herndon, Alma Lee Chandler, Sarah Nell Dixon. The family will greet friends from 5:00 – 8:00 on Wednesday January 30, 2019 at Almon Funeral Home in Carrollton, Georgia. Funeral services will be held on Thursday afternoon January 31, 2019 at First Baptist Church in Carrollton at 2:00. Entombment will follow at Carroll Memory Gardens. Pallbearers will be: Josh Dixon, Miles Dixon, Chandler Dixon, Adam Dixon, Ricky Greathouse and Jonathan Limbaugh. Honorary pallbearers will be: First Baptist Church Men's Sunday School Class and Charlie Vann. In lieu of flowers, memorial contributions may be made to First Baptist Church Legacy Campaign, 102 Dixie Street, Carrollton, GA 30117. "Email Address" would like to share the life celebration of Rufus Dixon. Click on the "link" to go to share a favorite memory or leave a condolence message for the family.